This highly mobile, jumping Nanobot was designed by a team of space engineers challenged to develop a Moon mission that was not only technically viable but could also make a profit. The annual SpaceTech Master Programme of the Technical University of Graz, Austria trains space professionals to combine space and business engineering. ESA Director General Jan Woerner asked the 2016 participants to come up with a profitable business case to fit within ESA’s Moon Village concept. 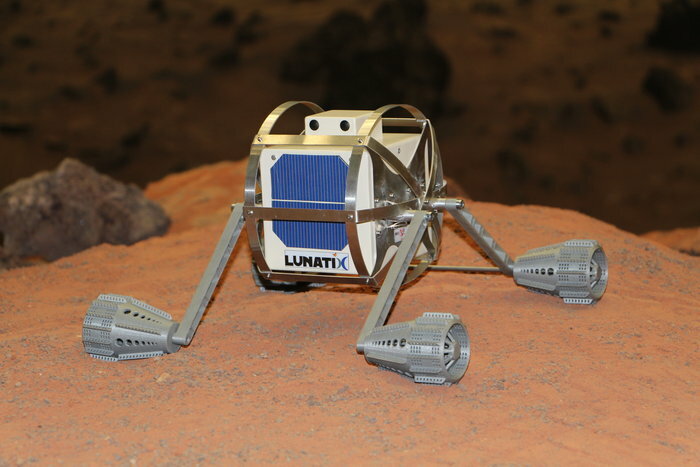 The eight SpaceTech 2016 participants presented the resulting Lunatix concept last month at ESA’s technical centre in Noordwijk, the Netherlands. The team designed these video camera-equipped Nanobots to tap into the $100 billion gaming market. After raising initial enthusiasm among Earth’s 1.8 billion gamers with controlling a virtual Nanobot on a simulated lunar surface, there will be the possibility to control real Nanobots on the Moon, in Pokemon Go!-style augmented reality scenarios. Science would be another business line, with the highly agile Nanobots able to probe sites of scientific interest such as lunar lava tubes. The Nanobots are designed to jump up to 3 m high and 10 m in distance in the one-sixth gravity of the Moon, which allows them to clear obstacles while offering an exciting gaming aspect. A series of Nanobots – formally known as Small Mobile Platforms – together with the Main Mobile Platform larger rover would be deployed on the Moon. Along with additional scientific payloads, the larger rover would recharge the Nanobots and give them shelter during the two-week lunar night. The SpaceTech team carried out a rigorous end-to-end design process, ensuring their robots could survive harsh lunar temperature swings and radiation and dust exposure, as well as continuously communicate with Earth – and their customers. Now the study has been completed, the participants are investigating plans to establish the company next year. For more information read the full summary here.